Turn your phone into an ultra slim wallet! Attaches to any phone or case. Tired of bulky wallets? The Phone Pocket lets you turn your phone into an ultra slim wallet, that holds up to ten cards! 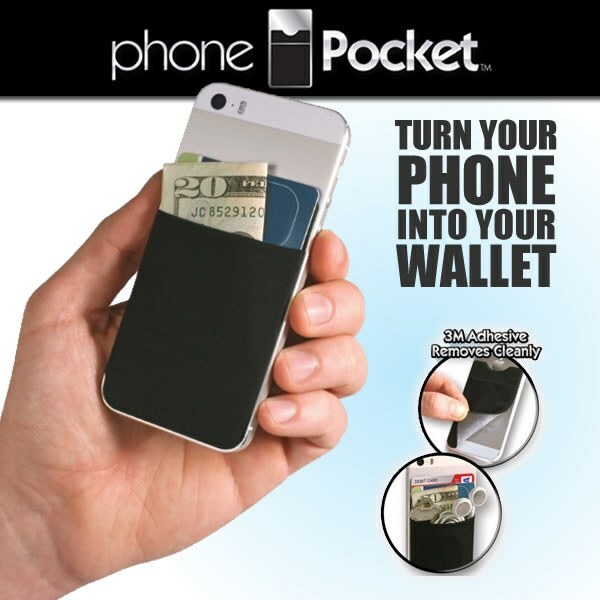 Just stick the Phone Pocket to the back of your phone or phone case to hold your credit cards, ID&apos;s, cash, and more. The stretchy material keeps your belongings secure and conveniently at hand. I am still waiting to see if this pocket will drop off or if the cards will fall out......still waiting!! This is worth the money....it does exactly what the advertising says it does!! I have my credit card in the pocket while I am at work.That way I don&apos;t have to go to the car to get my cards. It holds it well and no chance of coming out!! Handy way to keep your stuff together, Sturdy and attractive. Very worth the money. very convienent! keeps everything close! No digging to find things. I can&apos;t live without this! Love it. I always have my phone close at hand but it&apos;s always a hassle to dig out my ID or credit cards. With this, it&apos;s right in reach at all times. Now my hubby wants one! A little tight for my phone but I use a case. Will experiment more.